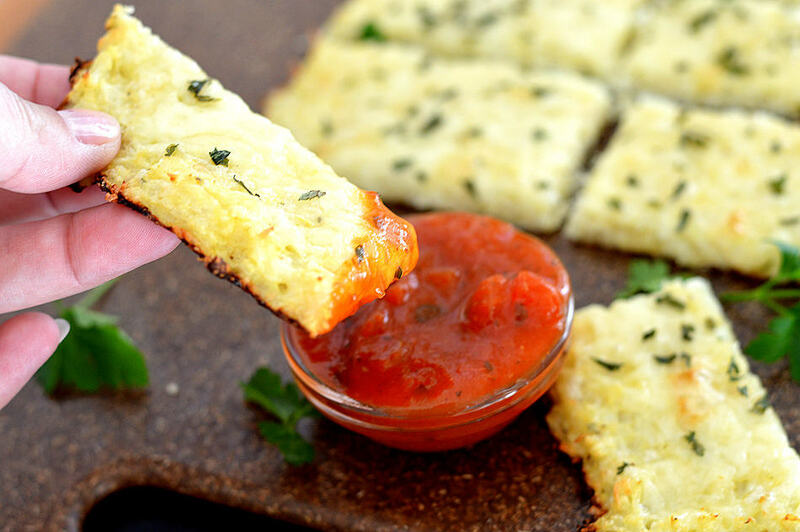 It seems like this recipe for Low Carb Cauliflower Breadsticks is all the rage on the Internet lately. I actually have been following a low carb lifestyle and found it in a Facebook group. I miss bread the most, so I decided to try it and I have to say…I was not disappointed! Is it bread? Well, no. But we already knew that, right? 😉 It was, however, really tasty and satisfied my craving. I think you’ll love it too! 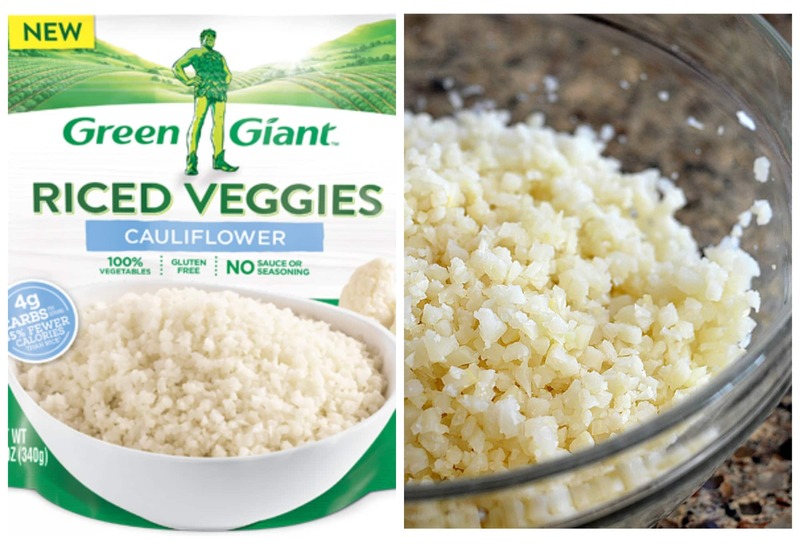 You might have seen that Green Giant™, among others, have jumped on the healthy veggie foods bandwagon lately and don’t the hard work for us by ricing the cauliflower! However, if you can’t find it, all you need are cauliflower florets that you pulse a few times in a food processor. I will say that after testing this recipe, I would recommend thawing and microwaving for a few minutes followed by a quick squeeze to release some of the moisture. I didn’t and you an see, it still worked out just fine. This recipe is vegetarian, but I will provide you with vegan alternatives. 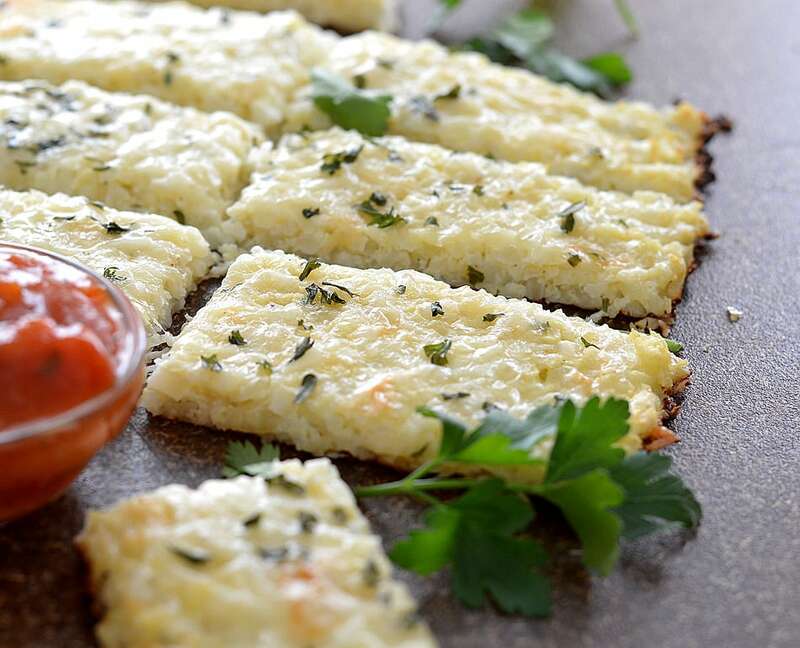 All of the ingredients are combined (except the reserved cheese and parsley) and formed by hand into a rectangle. If you do not have a silicone baking mat, you can (and should) use parchment or it will stick. 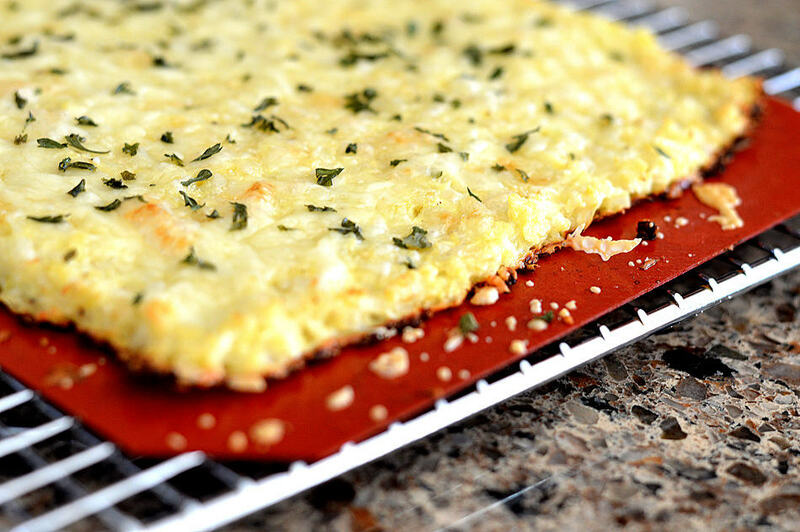 After the initial baking time, the remaining cheese and parsley are sprinkled over top and it’s baked until golden. Allow it to rest for a few minutes before cutting. It will firm up enough to pick up much like pizza. When I make these again, and I will make them again, I think I would rice the cauliflower just a bit finer. The Green Giant bagged riced cauliflower was very uniform in size and almost made it harder to get the batter to hold together. But I really enjoyed them. The recipe was simple and straightforward, so I thought I would share it with you. I just used a simple marinara sauce (<—low carb, of course). Nothing fancy. They were really yummy! 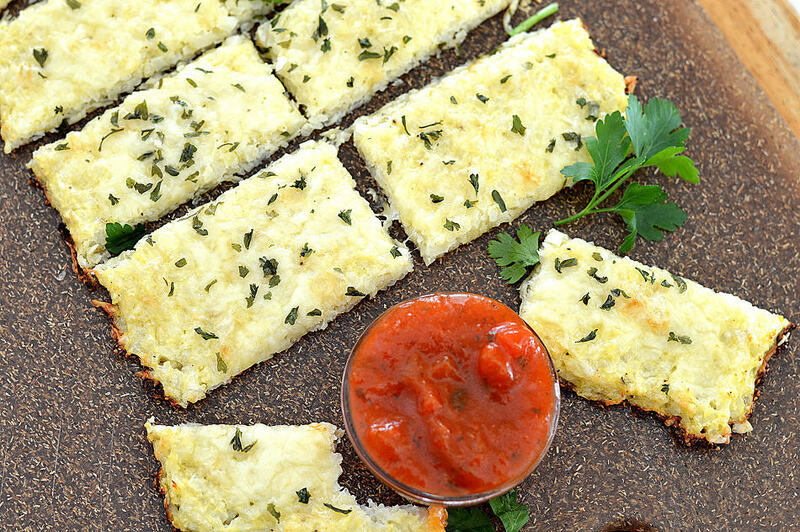 Combine the riced cauliflower (pressed of as much water as possible) with all of the ingredients EXCEPT the parsley and the 3/4 C Mozzarella. Mix well. Using your hands, press and form the mixture onto a silicone or parchment lined baking sheet. About 1/4" thick, squaring off the edges. Bake for about 10 minutes or until the bottom and edges start to become golden brown. Add the remaining mozzarella and half of the parsley. Bake until golden. Allow to cool for a few minutes before cutting into strips. 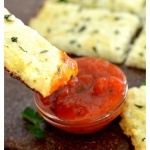 Serve with marinara sauce and garnish with the reserved parsley. You certainly could blend it, but I didn’t. So the recipe photos you see is how it turned out for me. I noticed that you used frozen. If I’m using fresh cauliflower, will I still need to squeeze out any moisture from it, or pre cook it? I haven’t used any type of riced cauliflower before, so I’m not sure. I also really don’t have any room for error, due to a tight budget.